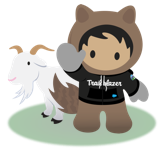 If you embed a Salesforce Flow into a Visualforce page, you can use the "finishLocation" attribute to redirect users to a specific screen in Salesforce. However, if you're calling flow from a custom button or custom link, there is no simple way to cause the flow to end on a specific page. For instance, if I invoke a flow from a custom botton on an Opportunity record, I would like the process to end on that record's detail page. It would be great if a "Navigate To URL" option was available in Cloud Flow Designer palette as an "end process" element. The component would require a single input arg (the record ID or URL that the user wanted the flow to end on), and it would have to be the last step in a process flow. Implementing this would eliminate the need to build a custom VF page for flow navigation. Hi Everyone- this Idea recently passed the point threshold and has been sent to our Product team for review. We'll circle back with an update as soon as we have more to share. This is one of the strangest things about the Visual Flow that I have come across yet. So strange. Just kill the flow and send the user back to the record they were on when the kicked off the flow. Hi, Scott. To use Local Actions, you need to contact customer support and get your org enabled for the Local Action pilot. I've updated the docs at https://sites.google.com/view/flowunofficial/flow-action-components/load-web-page to make this clearer and talk about the pilot. the 4 times I tried to install in one of my test orgs. And the install documentation did not make sense to me. Hi, everyone. I'm a product manager on the Flow team at Salesforce. I wanted to let you know about a new way you can accomplish this. The open pilot for Local Actions allows you to install a new class of Flow elements that you can drag into your Flows. One of these has been built and published by the community, and is called "Load Web Page". I've been using it to redirect my flows to a new page when they're done. We really need this to happen to make flows more efficient! Please update if this is coming in any recent release. Visual Flow is a very great tool, the finish location is the only feature missing to be Sooo great ! The masses have figured out how to get around it but it only works if you have a screen to Finish the interview. Otherwise, you are out of luck and have to abondon the flow aproach altogether. Come on, Salesforce. Surely your product team can review and resolve. I love the drag and drop - but oopsy - then pull it all into a VF page to redirect back to where the user was. Any update? On creation of record need to be on the edit mode of the created record in lightning through flow. As url hacking is not supported in lightning, it is major blocker faced at the moment. Any help or alternative will be highly appreciated. Thanks! Surprised this is not already a built in functionality. Adding my vote! This would be a big win for an "admin-veloper" like me. Custom VF pages are a bit intimidating.